Notes: Dairsie Castle is a restored tower house located 1.3 kilometres (0.81 mi) south of Dairsie in north-east Fife, Scotland. The castle overlooks the River Eden.The first castle built here was the property of the bishops of St Andrews, and may have been constructed by William de Lamberton, bishop of St Andrews from 1298 to 1328. A Scottish parliament was held at the castle in early 1335. The castle was rebuilt in the 16th century by the Learmonth family. James Douglas, 4th Earl of Morton, then regent of Scotland, laid siege to the castle in 1575. 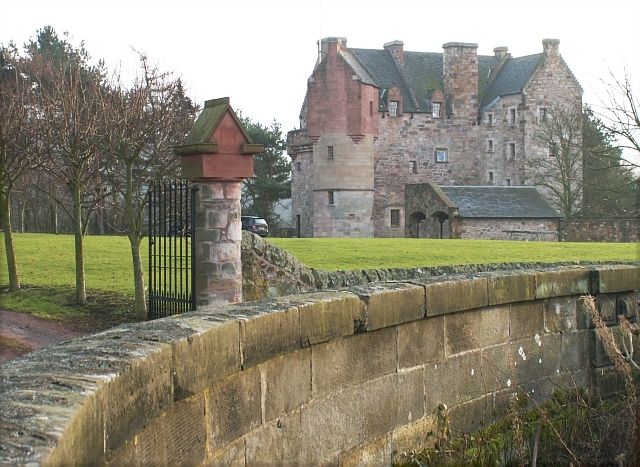 King James VI of Scotland stayed at Dairsie Castle in 1583 following his escape from the Raid of Ruthven in June 1583. In the 17th century it was sold to John Spottiswoode (1565-1639), Archbishop of St Andrews, who built Dairsie Old Church next to the castle in 1621. Dairsie Castle became ruinous in the 19th century, but was rebuilt in the 1990s, and is now operated as holiday accommodation. It is a Category B listed building, and was formerly a Scheduled Ancient Monument, having been de-scheduled in 1997 prior to the restoration works.